I need help with part selection, particularly case/fan selection, for my near-future GTX 680 + Ivy Bridge system. No overclocking is planned, but I expect the heat output of a stock 680 to be every bit as enormous as the 580 before it. In other words, aftermarket cooling (such as the Accelero attached to this 580: http://www.newegg.com/Product/Product.a ... 6814162073 ) is the only way to have a chance at a relatively-quiet system, and internal coolers like that require good case airflow. Further complicating things is that I've developed an affection for Micro ATX cases. This system will visit LAN parties occasionally so the smaller size will make it easier to handle. I'm willing to give up on this, though. No real budgetary constraints, as long as there's value. An example of what I'm looking for is the Silverstone PS-07 ( http://www.newegg.com/Product/Product.a ... 6811163186 ). I like that the drive cage can help support the weight of the GPU, but I'm a little worried about air flow; the performance and quality of the stock fans is completely unknown. I've looked at the Fractal Design Define Mini, but it doesn't look like it can accommodate a long triple-slot GPU. Does anyone have any guidance? RV02 and FT02 can both fit the 5970 which is pretty long, I don't know the exact dimensions of a typical GTX680 but there is a fair chance that they will fit. The good old P18x have removable drive cages so I'm pretty sure they can fit as well. The PS-07 is almost identical to the TJ08-E, you can get an idea of what to expect from my MicroMi build (check my sig), no specs have been released for the GTX680 (or GTX780 if nvidia skips the 6XX), but i dont think you will have a problem with twin 120mm on the front, i kinda think you will get even better temps than me, as the 180mm bearly reaches the GPU but not the top to help push it out... that said nothing is certain yet, but i think its a viable idea. But i would only go with PS-07 if there is an micro atx available on launch, i would keep my eyes on the new Gene Z, on Sandy bridge took some time to be released as it was Z68 chipset and wasnt released with the H67/H61/P67, but this time seems the Z77 will be out on launch... so that would be my choice for the PS07. Now if its not available on launch i would probably build on another case, i like Solo II for atx setup, but there are tons of options to chose there. If you go for it, please post some pics of your build, im really interested on the PS-07. The Revoltec Sixty3 is quite nice, I use it with a GTX480 with the big Accelero cooler. It's got space for 140mm fans all around. Since they are rushing the 680 out I predict it will be more alike the 480 in heat and noise, the 580 was an improved version of 480 (what it would have been if they hadn't rushed it). 1) i5 [email protected] w/Silver Arrow, 8GB DDR3, Intel 120GB SSD, GTX 580 w/Shaman, Seasonic X-750, ASRock P67 Pro3, BenQ 23.6" 120Hz LED. 2) [email protected] w/Megahelem, 8GB DDR2, 6 HDDs for ~4TB, 2x GTX 8800 SLI, Seasonic X-750, MSI P6N SLI Platinum, Samsung 22" LCD. It will come out April 12th, I don't think it's rushed. ... I expect the heat output of a stock 680 to be every bit as enormous as the 580 before it. 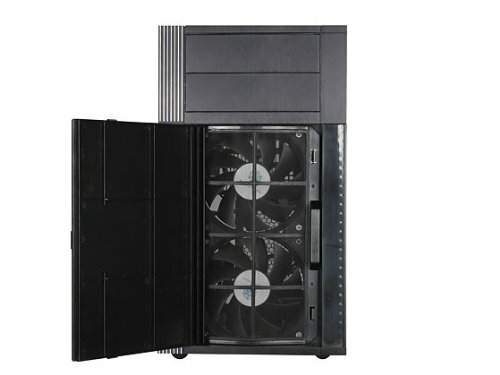 In other words, aftermarket cooling (such as the Accelero attached to this 580: http://www.newegg.com/Product/Product.a ... 6814162073 ) is the only way to have a chance at a relatively-quiet system, and internal coolers like that require good case airflow. The Tahiti core (HD 79X0 ) has 4,3 billion transistors @ 925 Mhz max. The GK 110 core (GTX 680/670/660TI) has 6,2 billion transistors at 850 Mhz max. .The 7970 uses 295W at Furmark with 3GB of memory. The 680 has a bigger core, slightly lower cloacks and 2 GB of memory, both cards' memory is clocked at 1375Mhz, or 5500 Mhz in marketiong speech. The GTX comes in at 320W Furmark. I would expect the 680 to consume about 15% more: 360W Furmark, 265W in Games. In the past the have power consumption has gone up roughly about 15% per generation. I will plan the purchase of a my new PSU accordingly. All of this is speculation at this point, so take it with a grain (or heap) of salt, but I have followed the rumors closely. A good aftermarket cooler will be a must have item. You will also need a well ventilated case. The TJ-08E looks good, and is well ventilated. The Fractal Design and Define Mini is dampened, but may need more than the standard vetilation. The Fractal Design Arc Mini and Core 1000 are more open, which is better for ventilation, but worse for noise. Bitfenix will bring a new line of cases including an interesting Micro ATX and ITX case, they should be out before the new graphic cards. The Xigmatek Gigas is new Mini ATX cube. It's bigger than other cubes, made from aluminum and comes with 4 120mm fans. No reviews yet, shoub be in stores in march. Lian Li has a series of cube cases: the PC-V 35x. They are alimium, too, but the 120mmm fans are a little loud. Flanker; the RV02 and FT02 are good cases but larger than what I'm looking for. Abula; if I build it in the PS07 (which appears to be the best candidate at the moment) I'll be sure to take good pictures and post them here. I know there were major differences between the Sandy Bridge chipsets, but since I'm not planning on any overclocking and I'm using a dedicated graphics card, the feature differences between the Ivy Bridge chipsets aren't that important; the layout and features of the board guide my choice. Tetreb; there isn't a lot of good information about the Sixty3, and their website only has 3 pictures... and it looks big. I'll need to learn a lot more about it before it can be considered. boost; We won't really know the power/heat output until reviewers get their hands on it. I agree that the numbers to be big so an Accelero-like cooler will be needed to cut the noise down. The two front fans on the PS07 (or big single fan on the TJ-08E) provide a lot of airflow, but I don't know if it will be enough. A big part of what attracts me to the PS07 is the fact that it's fans are 120mm, so I have tons of options for replacements. Fractal Design's current MicroATX cases won't work with a triple-slot cooler; the lower drive cage will block it and cannot be removed without cutting metal. I forgot about Lian Li's PC-V34x designs. I think, like the Xigmatek, I was worried about fan noise but I'll have to study some more. The Revoltec hasn't been reviewed in English it seems. It's regular ATX though. Don't those have trouble with long cards? I don't get it, why do so many cases support 5+ 3.5" HDDs but not long videocards? Where are the cases that optimize for long cards, 1 HDD, 1 ODD, 1 SSD, good airflow and low noise? The Silverstone Sugo SG-08 ( http://www.silverstonetek.com/product.p ... 17&area=en ) gets you almost all the way there. SPCR reviewed the nearly-identical predecessor SG-07 ( http://www.silentpcreview.com/silverstone-sg07 ), and observed that while it's incredibly compact, the video card gets no airflow other than what its own fan(s) can pull in from the ventilation on the side. This means big video cards will need to use blower-style coolers with the associated vacuum-cleaner levels of noise. SPCR reviewed the nearly-identical predecessor SG-07 ( http://www.silentpcreview.com/silverstone-sg07 ), and observed that while it's incredibly compact, the video card gets no airflow other than what its own fan(s) can pull in from the ventilation on the side. This means big video cards will need to use blower-style coolers with the associated vacuum-cleaner levels of noise. Why would you need fans blowing on fans? The fans of a video card are around 4-5mm from a nearly completely open side; don't they get enough cool air? I haven't actually seen a review of those cases with a hot video card + good cooler, but at least intuitively it should work fine. The issue isn't air flow, it's noise suppression. With the SG-07 (and 08), the GPU fan has an uninterrupted path to the outside environment. SPCR's review ( http://www.silentpcreview.com/silverstone-sg07 ) used a big-but-not-state-of-the-art GPU and still had noise problems; it would only be worse with something more powerful. An indirect path between GPU fan(s) and the outside world seems to be a requirement for a silent gaming PC. I'm also doubtful that a blower-style cooler could ever be quiet: they have to cram a lot of air out a single expansion-port-sized exhaust, which takes a lot of force (and noise) to achieve. Internal GPU coolers will blow hot air everywhere, requiring sufficient case airflow to remove. Modern cases will multiple 120mm+ fan mounts have no problem here. I was thinking about a good internal non-blower cooler; the 18cm case fan should get rid of any excess heat. Agree that a blower with a near-open case side like that is a bad idea. It looks really cool. With an optical drive and a hard drive installed, I think there's only room for a single 140mm fan in the front and one 120mm fan in the back. That's still very good for ITX. The power switch and the ports are on the right side of the case, which is the wrong side to me. I'm right handed and the case is always on my right side. Won't fit a triple-slot Accelero-like GPU cooler. The case itself is wide enough, but the motherboard is too centered. The PSU compartment has an almost fully-closed back, which cripples the ability to use modular power supplies. Cable management will be tough. I think the top is an open mesh; this is good if someone wanted to put a big water cooling radiator up there, but it needs to be blocked for a quiet PC. It seems unnecessarily big for a Mini-ITX case. It could be narrower without giving up any functionality. The GTX 680 uses less power (and outputs less heat) than anticipated, reducing the cooling requirements. I discovered a new case: the Silverstone SG04-F. In terms of volume, this is the smallest Micro ATX case that has two 120mm fans and can accommodate a 10.5" GPU (or two). Very tempting. I'm really happy about the 680's efficiency. The potential for (relative) quietness seems very good; we'll know for sure when designs with more sophisticated cooling appear--everyone's using NVIDIA's reference cooler right now. I'm looking for such tiny silent case with possibilities. Silverstone TJ-08 looks better to me but may be louder (no dampening). Any other ideas? The TJ08-E is a fine case the problem is the 180mm fan, that imo at the stock settings is way to noisy, i usually run mine at 600rpm where is decent, still not silent, but just a low wosh. 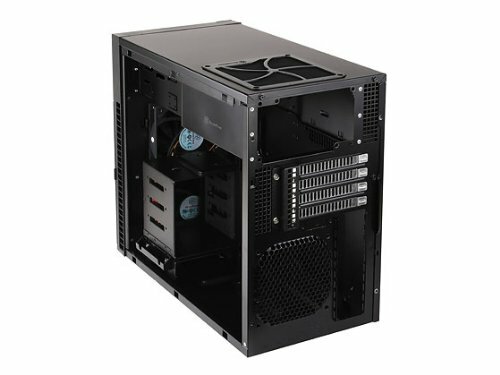 But i would probably go with another case for small micro atx setup, very similar to TJ08-E is the but two big changes are 180mm for 2x120mm and no frontal mesh but like most the quiet cases takes air from the sides, my guess with you able to chose your own 120mm fans (nexus basic, scythe slipstrems, noiseblockers M12S, etc), you will end up with quieter setup. 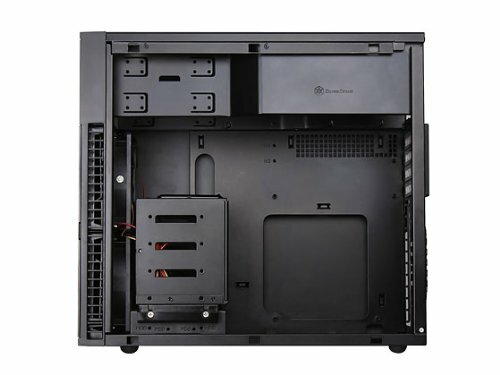 Silverstone Tek Micro-ATX Mini-DTX, Mini-ITX Mini Tower Plastic with Aluminum Accent Computer Cases PS07B (Black), its even cheaper. The Fractal Design Define Mini and the SilverStone Precision PS-07 are the finalists in my case search. My wife likes the aesthetics of the Define Mini, but I like the much lighter weight and smaller size of the PS-07. Overall, I'm leaning towards the Define Mini, at the moment. The sound dampening and numerous fan mounts are attractive. I'm strongly considering modifying it by removing the officially-not-removable lower drive cage and hiding an SSD somewhere. This would allow both front 120mm fans unimpeded airflow to the video card. Removing the plastic fan covers seems like an easy way to improve airflow, also. On the other hand, the PS-07's drive cage also acts as a support brace for the heavy video card, which may make it more durable during transport (to LAN events, for example), and its orientation doesn't impede airflow as much as the Define Mini so it's not as tempting to remove it. While that technically may be the smallest mATX case, I still think the TJ08-E/PS-07 is superior because of the more standard layout. With the SG04-F you're sacrificing 3.5" bays and CPU heatsink space for a negligible volume reduction. To me, it's not worth having the space restrictions on internal components. And considering how cramped it looks you'll probably need some higher speed fans or potential spot cooling. I also REALLY dislike the PSU-over-motherboard mounting location that's just so common in smaller cases. EDIT: I just noticed the SG04-F has that wacky card expansion slot at the top of the case. How does that even work? I also REALLY dislike the PSU-over-motherboard mounting location that's just so common in smaller cases. The theory is that the PSU fan would provide enough airflow. SilverStone actually sells a CPU heat sink that lines up almost perfectly underneath a PSU's 120mm fan. In reality, I don't think this would work as a modern high-efficiency/low-noise PSU won't even run the fan most of the time. I spent time thoroughly studying that case shortly after I posted about it, and came to the same conclusion as you: not enough airflow for a quiet gaming system. I just noticed the SG04-F has that wacky card expansion slot at the top of the case. How does that even work? I think the idea is to put an expansion slot mounted fan controller there, thus not wasting one of the 4 "real" expansion slots. Fractal Design does something similar in the Define Mini. Congrats, its a nice case, hope you share your experience and tests with us about it. Btw I would go full Asus on it, ASUS Maximus V Gene LGA 1155 Intel Z77 + ASUS GeForce GTX 680 ASUS DirectCU II + Thermalright HR-02 Macho, specially with the Asus XpertFan2, it should end a pretty nice tweakable micro atx build, really powerful and quiet. I've been strongly favoring the Maximus V Gene for the motherboard. I'm mildly concerned about its power consumption (and associated cooling requirement) given its vast feature set, but I think it'll be okay. Of note, this motherboard has a mini-PCIe and mSATA riser card, but its positioning will conflict with a fan installed PS-07's rear location. It might work with a fan if the some of the fan's frame were cut away. Fortunately, I'm not planning to use this feature so it's a non-issue. Speaking of fan modification, one of the screw holes for a side panel slightly intrudes on the rear fan's chassis. I think the fan would still screw in, but the holes wouldn't be centered. I haven't yet decided whether to use a rear fan (leaning yes), but I'll make the necessary modifications if I do. For the CPU fan, I've been looking at the Noctua NH-U9B SE2 92mm SSO CPU Cooler. If I used the Maximus V Gene, I wouldn't have to use a Y-splitter to use two fans in a push-pull configuation: the motherboard has two CPU fan headers allowing it to control and monitor both fans directly. The system will occasionally travel, so I'm reluctant to use 120mm+ coolers for weight/stress reasons. One of the nice things about the PS-07 is the heat sink holder for tower coolers. I have done 2 builds with gelid tranquillos and it makes a 120mm towe cooler really secure. IMO, if you like noctua (I sure do) I would get a u12p se2 take the 2 fans and put them on the front of the case and grab a nf-f12 or scythe slipstream for the heat sink. Looks to be a sick build, I second the gene V.
The Noctua NH-U9B SE2 is a great cooler, specially for its height, there are some cases like that dont allow 160mm height coolers, this is where this noctua shines, but overall i think its inferior to the Thermalright HR-02 Macho, which is almost the same price, the HR02 will allow with its asymmetrical design (extends to one side, in my case to the back of the case)to install higher height memory, probably not that height as the PS07 hdd cage might interfere, but its design makes it very nice as it will be almost a push pull with the back case fan, you can look into my micromi build (below on my sig), to get an idea of how the HR02 fits on the case, it should be the same on the PS07. The fan included (TY140) is also very good, i have one running on my mini build, running at 700rpm where i cant hear it, with the new Asus Xpert2fan you might be able to get it even lower, i seen one person running it at 600rpm. The HR02 is a great cooler not only for its price, but its bigger spacing between fins, makes it very efficient cooler with low air circulation, i even see some people cool a 2500k stock with only the TJ08 frontal fan (no cpu fan no back case fan), and still acceptable temps. Either way its you money and you preference, im just pointng my personal experiences with a very similar build, at the end go with whatever you think would do a better job. You've done two PS-07 builds already? Good to know I'm not the first I played around with the heat sink holder and I've come to agree with you, it seems strong enough to support the weight, so I'll probably give the U12P SE2 a try. I've already replaced the front fans with Noctua S12B-FLXes. The Noctua NH-U9B SE2 is a great cooler... (snip) ...but overall i think its inferior to the Thermalright HR-02 Macho (snip).